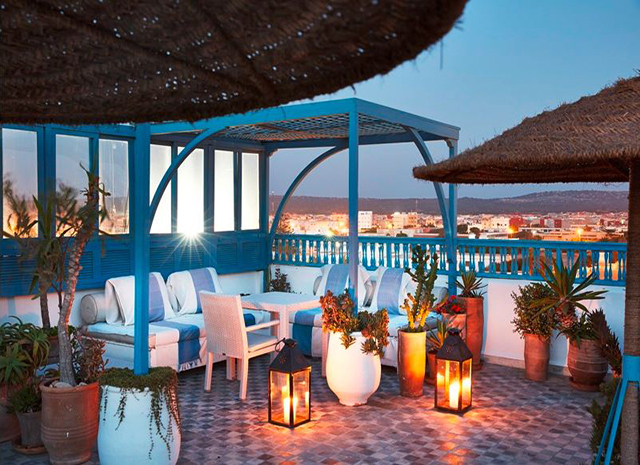 L’Heure Bleue Palais sits at the edge of the Medina of Essaouira. Known as Mogador well into the 1950s, Essaouira is a port and Atlantic beach resort two hours west of Marrakech. Essaouira’s white and blue houses are protected by the terracotta battlements built by the Portuguese in the 16th century. Long a crossroads of trade connecting Africa, the Arab world and Europe, the town’s romantic souks, alleys and houses are reminiscent of the charming and intimate Marrakech of decades ago. Once the palace-riad of the Pasha of Mogador, L’Heure Bleue Palais was built with a floor for each of his four wives. Long abandoned, the building was transformed a decade ago into an elegant, tasteful, lavish, antique- and art-filled boutique hotel. Its 33 guest rooms and suites are in four different styles: African, Moorish, Portuguese and British. The riad surrounds a palm-filled courtyard where drinks, breakfast and afternoon tea are served. The elegant restaurant serves Moroccan cuisine. And the rooftop sundeck and pool are ideal for a day’s sunning, lunch and lazing.